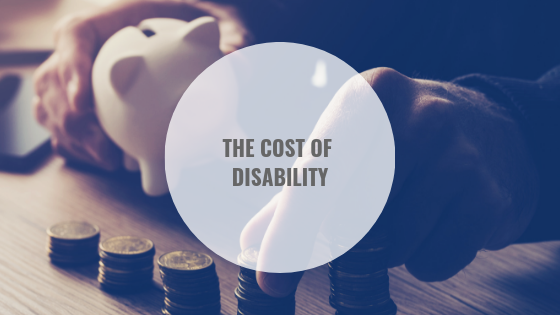 The cost of disability due to injury or illness is significant and stems from lost work time, medications, equipment, costs of personal care, therapy and more. When struggling to make ends meet, people encounter stress, anxiety, panic, excessive worry, loss of sleep, relationship issues, poor decision making, and can result in addictions as a form of poor coping. You can imagine how hard it would be to heal from injury or trauma when significant money stressors are created as a result! Our OT-V episode below provides insight into how an Occupational Therapist can help you or someone you love plan for future costs related to the specific disability, provide treatment to help you manage your finances more efficiently, and deal with any associated symptoms. I was raised in a very tidy family. My grandfather had polio and thus my father was raised in a home where clutter was not an option, because if my grandfather tripped on something “lying around” he could be seriously hurt. My grandmother took it to some extremes (like waxing her garage floor), but the net result was a tidy dad that instilled the benefits of being organized on me. I am very environmentally driven. I have a hard time being productive or functional if my space is uncomfortable. I keep my office, home and car reasonably organized. I know where the bills are that I need to pay, the ones that I have already paid, where my spare car keys are, and what I have in the fridge and freezer that could pass as dinner. I can usually answer the “mom, where is the ?? ?” question and keep commonly used items in consistent places. I label things to make search and locate easier, and so that I can blame the kid responsible to avoid the “wasn’t me” response (when they were little they had one color each for bowls, plates and cups and they still have different colored towels). Having four teens and four pets, sure our house is in constant need of tidying, and getting my kids on the tidy train hasn’t always been easy. I try to give them some freedom over their bedroom, but once a week it needs to be “cleanable” and we have a special needs dog with an affinity for smelly socks (not clean ones), so at the least, they need to keep their dirty clothes safely stored in their “dog-can’t-reach” laundry bin. I believe though that being organized is more than a skill, it is also a lifestyle. Like being active, or being a non-smoker, deciding to be organized is a conscious choice, then it requires commitment to get and stay there. But like all “lifestyle choices”, this too can get derailed. As an occupational therapist “organization” often is incorporated into our treatment of clients, and this takes many forms. 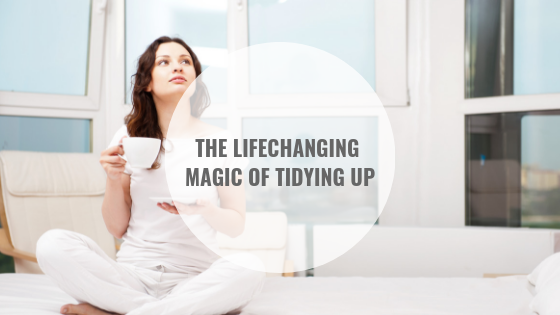 Sometimes it is organizing items into reachable places from a mobility device, or to conserve energy and reduce the pain caused from lifting the heavy pots from the bottom cupboard. Sometimes it is mail, email, and paperwork to ensure urgent items get addressed and bills continue to get paid. Maybe it is just putting like items together to make it easier and more efficient to find things (especially with cognitive impairment or depression that can make initiation, motivation, and memory impaired). If we are gearing up for a home renovation to address accessibility needs, sometimes purging, sorting and storing or discarding items is necessary to make room for the upcoming changes. Marie Kondo (www.konmari.com) has become a Netflix, YouTube and internet sensation with her “Life Changing Art of Tidying Up” book and series. She coaches only keeping items that “bring joy” and offers some suggestions on how to sort, fold and emotionally process keeping things we love, and letting go of the things we don’t. While I am not sure filing a utility bill, organizing my doggie poop bags, or emptying the overflowing bathroom garbage are things and items that “bring me joy”, I love her approach to folding and agree that your home should be filled with items that reduce, not increase, your level of stress. In the end, being organized is efficient because when you can find things you are not spending that emotional, cognitive and physical energy “looking around aimlessly” all the while getting frustrated, or worse, tired and angry. The time you save by being able to navigate and find the things in your own home quickly can be spent on other meaningful, purposeful and joyful activities. And that is where I agree with Marie that organizing can help us to “choose joy”. Caregiving is a job. A job most people don’t apply for, aren’t trained for, do not get paid for, and receive little to no time off from. When a loved one is injured or ill often the job of full-time caregiver falls on the spouse, adult children, or other family and friends. Though many are happy to give as much love and support as possible in their loved one’s time of need, the job of caregiver can be isolating, exhausting and can often result in caregiver burnout and additional health-related concerns for the caregiver themselves. Remember that you cannot take care of someone else if you are not taking care of yourself. 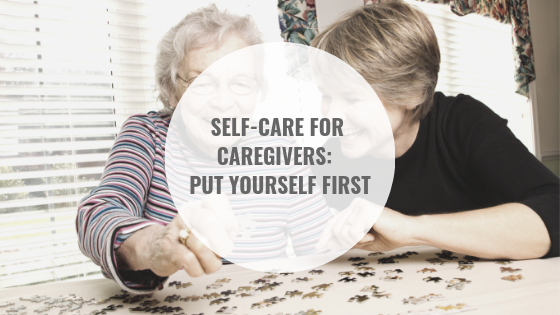 You may risk becoming useless to your loved ones if you do not first take care of yourself. The following infographic provides more information about the caregiving role and solutions to help reduce the mental and physical health-related issues that often stem from the job of caregiver. 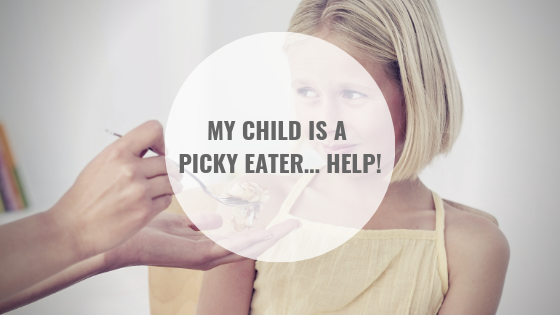 My Child is a Picky Eater… Help! Do you have a child that is a picky eater? You are definitely not alone! Picky eating is a common issue, and while it is normal for kids to have food preferences and dislikes, it can be quite concerning for parents. The good news is an Occupational Therapist can help! Watch our popular video below to learn more about how an Occupational Therapist can help families overcome the picky eating problem and raise healthy, happy eaters. The following article care of CBC provides another shining example of the value of Occupational Therapy — helping to bring meaningful activities into the lives of our clients. 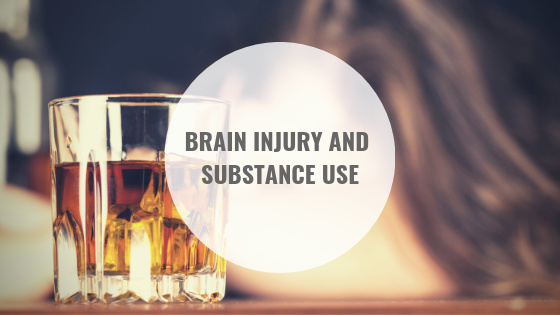 In our previous blog post titled “Brain Injury and Substance Use”, we discussed how the cognitive and emotional changes associated with brain injury can overlap with substance use. But what wasn’t covered was the role of the Occupational Therapist when working with clients who have these challenges. While our role is complex in cases like these, we have tried to simplify how we use function and meaningful activity in combination with direct treatment to address some common themes as outlined below. It is important to recognize that the above strategies are not meant to encourage substance use but ensure the safety of the client when they are not willing or able to stop. Sometimes just reducing the harm is all we can offer until the harm can be eliminated. Clinical Example: A man with previous regular alcohol use prior to an accident, now has seizures when he does not have alcohol in his system. Thus, it is actually more harmful to ask this client to not use alcohol. Instead, monitoring the amount he drinks and ensuring he has regular supports at home are two strategies that can reduce the harm that alcohol may cause. The financial, behavioural, and health effects of substance use often negatively impact a client’s ability to reach their goals. An occupational therapist can help a client to understand and hopefully address the gap between substance use and being able/unable to move forward in other areas of life. 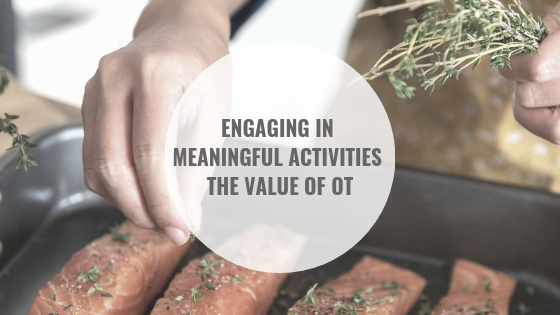 An OT may also strategize ways to achieve goals despite substance use by planning use around occupations and this, in turn, may help decrease use over time. Clinical Example: An individual with a brain injury has a goal to return to work but does not have the insight to recognize how using narcotics would impact their success on the job. Thus, helping the client break down the requirements of a job, recognize poor fits, and then implementing strategies to change substance use behaviour so that it doesn’t impact work (in the case that abstaining from use is not an option) could be an intervention focus. Often, substance use is time-consuming between acquiring, using, and coming down from the influence. This becomes a major challenge when people stop using because there is a lot of free time that may lead to boredom and relapse. This is an important place for occupational therapists to intervene by helping the client identify meaningful activities to engage in when they are feeling an urge to use. This could involve interests and values, or just discussing past activities that the client would like to resume. In the case of someone with a brain injury, more guidance may be required to identify triggers (if the client has low insight what is triggering). 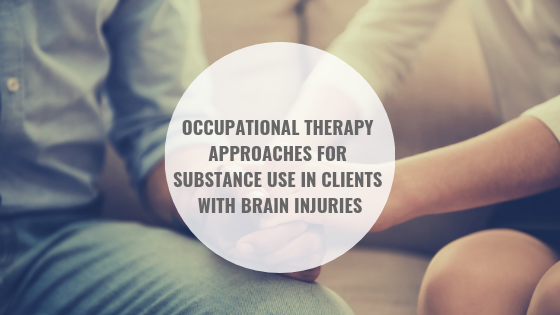 In addition, activities that the client can perform may be different following a brain injury, and thus they may need support in finding new meaningful activities to fill the time that was previously taken up with substance use. As the above indicates, implementing any of these strategies will require the client to exercise a high level of control over their addiction. 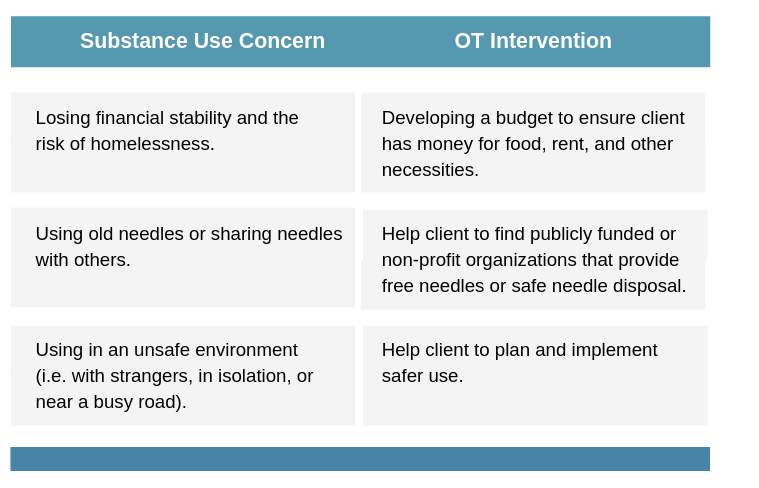 Thus, an OT can help support and accommodate each client’s unique situation by providing remedial and compensatory strategies to help clients transition from the occupation of substance use, to other, ideally more meaningful and healthy alternatives. As clinicians working in the community with clients who have a brain injury, we all too often see the challenges of recovery impacted by the use of illicit drugs and alcohol. And while we treat both the brain injury and substance use as they impact function and the ability to participate in life roles, we often wonder, which came first? Statistics show that individuals with brain injuries have higher rates of substance use than the general population. However, statistics also show that individuals with brain injuries have higher pre-injury rates of substance use. While this does not explain a “causal relationship” or answer the “which came first” question, we know the interplay is complicated and that acquiring a brain injury can change the way the brain processes information which may influence substance use behaviours and patterns. Cognitive Changes: Having a brain injury can result in cognitive changes from mild to severe difficulties with memory and concentration, communication, processing speed, problem-solving, and more. Emotional and Personality Changes: A brain injury can also result in emotional and personality changes such as impulsivity, irritability, and lack of insight. The changes and symptoms mentioned above occur as a result of injury to the brain’s frontal lobe. The frontal lobe is responsible for more complicated cognitive processes. It helps us to problem solve everyday challenges and consider the positive and negative impacts of our decisions. 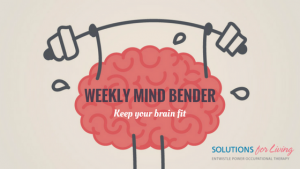 When a person hits their head or is jolted quickly, the frontal lobe will often impact against the skull – bruising, damaging, and disrupting the connections between the brain cells in this region. So how does this relate to substance use? Well, there are reward pathways in the brain which react and process substance use triggers and the associated emotional response. These pathways respond to the positive feelings associated with substance use and strengthen the more the substance is used, telling the brain to seek more. These pathways recognize triggers of substance use and respond by sending the “craving” to the frontal lobe. The frontal lobe determines whether or not the substance will be sought after, and if so, how the substance will be obtained and used. When we think about individuals with brain injuries and associated cognitive and emotional challenges, we can see how if a person has difficulty with impulsivity, for example, then ignoring a craving may be more difficult than it would be pre-accident. In addition, when a person with a brain injury decides to engage in substance use, challenges such as poor planning and problem-solving may make the use even more unsafe. Though we may not have evidence to connect brain injury to substance use directly, the cognitive changes in the brain are likely to make managing, using and even recovering from substance use much more difficult. So now that we have talked about how substance use behaviours and patterns may change after acquiring a brain injury, the question remains, What can be done to help an individual who has both a brain injury and problems with substance use? This question will be answered in part 2 of our blog post: The Comorbidity of Substances and ABI – the Role of the OT…stay tuned! Bjork, J. M. & Grant, S. J. (2009). Does traumatic brain injury increase risk for substance abuse. Journal of Neurotrauma, 26, 1077 – 1082. Ilie, G., Adlaf, E. M., Mann, R. E., Ialomiteanu, A., Hamilton, H., Rehm, J.,… Cusimano, M. D. (2015). Associations between a history of traumatic brain injuries and current cigarette smoking, substance use, and elevated psychological distress in a population sample of Canadian adults. Journal of Neurotrauma, 32, 1130 – 1134. West, S. L. (2011). Substance use among persons with traumatic brain injury: A review. Neurorehabilitation, 29, 1 – 8. Winter has fully arrived in Ontario bringing with it freezing cold temperatures, icy surfaces and lots of snow! If you don’t enjoy any of the these, that’s okay. Though you may not be able to safely or comfortably enjoy the great outdoors there are still great ways to remain active during the Winter season. 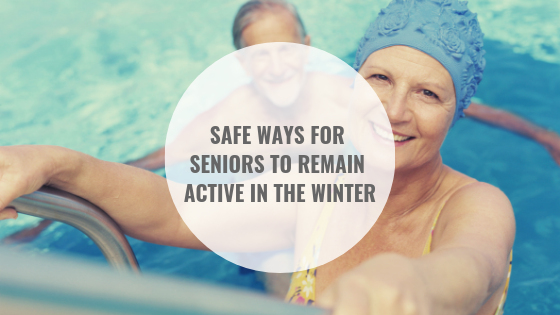 The following care of the McMaster Option Aging Portal discusses some great ways for seniors to stay active without the dangers that can arise when trying to brave the elements. 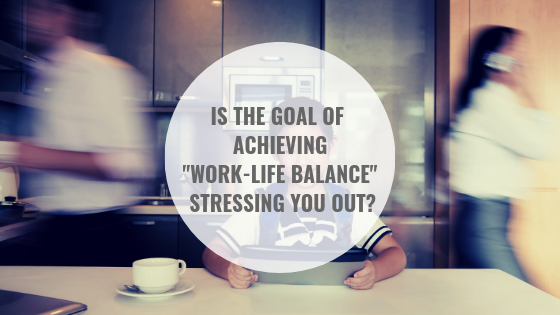 Is the Goal of Achieving Work-Life Balance Stressing You Out? What is your impression of work-life balance? Is your goal to create this ‘balanced lifestyle’ actually increasing your stress level? A lot of people find work-life balance a completely unrealistic goal that is impossible to achieve. Many find life demands are simply keeping them too busy to take time to relax. As we have discussed before, stress can cause heart disease, stroke, high blood pressure, and immunity issues. Statistics Canada says that 1 in 4 adults reported high stress in 2013, and high stress means that your mental and physical health are declining. The good news is that this is preventable. We simply need to change how we define “work-life balance” and create plans that will help reduce stress based on our individual situations. The following video from our OT-V (Occupational Therapy Video) series will help shed light on how to create a healthy balance without increasing stress or guilt if this balance is not achieved every day. Remember Occupational therapists know the evidence behind de-stressing, and which activities give you the most bang for your buck when you’re low on time. Contact an OT if you need help de-stressing and creating balance in your life. In many ways, the local coffee shop has become the new “mobile office”. Grab a beverage and maybe food, the WiFi is free and available, and no one needs to pay rent or worry about booking a reservation. I was grabbing a tea the other day and while in line there were two women at a table beside me having a meeting. I got the sense that the one woman was providing a service to help the other woman find her birth parents. Within minutes I knew where the one woman was born, her date of birth, birth name, the people that adopted her, date of her adoption, where she grew up, current address…probably enough information for identity theft (if I was into that), but definitely more than I needed or cared to know, and probably more than what this woman would want strangers to overhear. I have a client that likes to meet in a coffee shop. He prefers that to his house where he has family that can overhear our delicate conversations. Before agreeing to meet him there I reminded him that confidentiality is difficult in a public place, and there is no guarantee that people won’t overhear or listen to our conversation. We discussed alternatives, but in the end, he accepted the privacy risks and continues to request a public place as our meeting spot. As health professionals we are, or should be, always cognizant of personal privacy and information protection. We need to safeguard our clients from potential information breaches by keeping our paper and electronic records safe and secure, but by also being very aware of our surroundings and the likelihood of our services and conversations becoming public. Even in hospitals where there are ward rooms and open treatment areas, busy hallways and nurses’ stations: privacy and confidentiality, while difficult to maintain at times in these public forums, must be maintained. I recently had a medical appointment at a hospital. I had forms that I needed to bring. When I arrived, a volunteer took my forms and in the open waiting area began summarizing these with me. I was quiet and asked her if our conversation needed to be public. She was an older woman and seemed startled by my question. But honestly, not only was I uncomfortable talking to a volunteer (who is not bound by the same privacy and confidentiality rules as health professionals) about my appointment, but my discomfort was heightened when she was reviewing my personal papers openly. The risk of personal information and privacy breaches are significant. The media is constantly sharing stories of our information being sold, hacked or otherwise being “gathered” for purposes we don’t often consent to. I guess the most important thing to consider is that we are mindful and aware of the information we provide about ourselves, to whom we provide it, and the presence of others in these discussions. 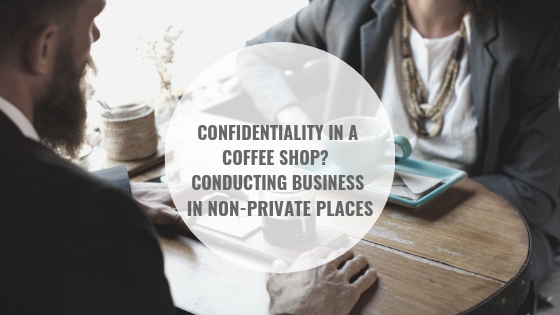 A coffee shop might be a suitable place to conduct some business, but I would argue not all, and that anyone engaging in conversations in public places, health professionals or not, need to be mindful and aware of their surroundings. Consent is key, and it is important to draw people’s awareness to the location and to ask them for their permission to have sensitive or otherwise private conversations in non-private locales.